Can't we wait until summer? Where can you live that you'll have to turn on the furnace and the central air all in the same week? In an effort to save a few of those hard earned bucks of ours, I've been resistant to turn on the AC for the first time this year. The temps had been in the mid-80s for a few days when this photo was taken. This was even before the Memorial Day weekend, so you see my mindset here, right? Fresh air is good enough for the likes of us. But then this. These dogs. 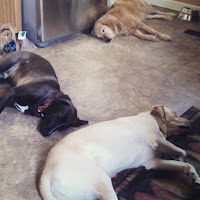 Oh, the silent suffering as they melt into the tile flooring of the kitchen. Fine, you guys. You win. I'll turn on the AC. The windows are open, allowing entry of the lavender's perfume from the south garden bed. If you can get past the shoe-sucking mud season, it's actually possible to enjoy the change of wind that brings Ohio springtime. 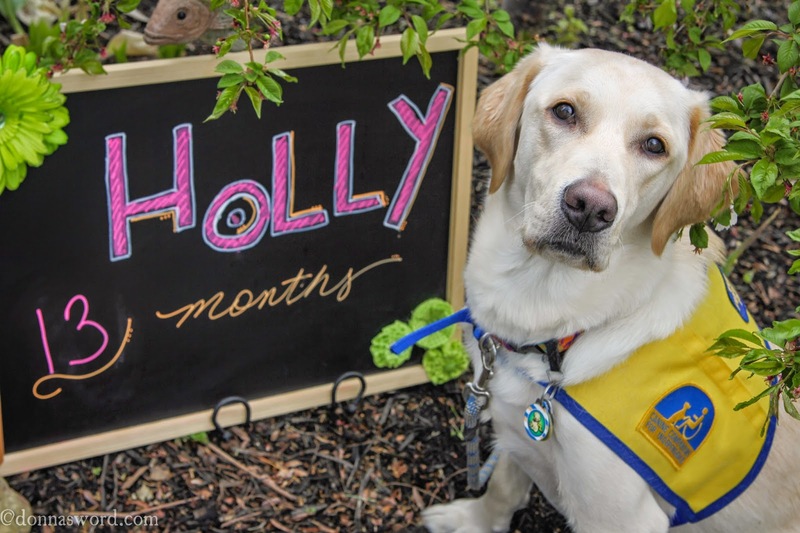 Holly isn't dazzled by the beauty of the blossoms, however. 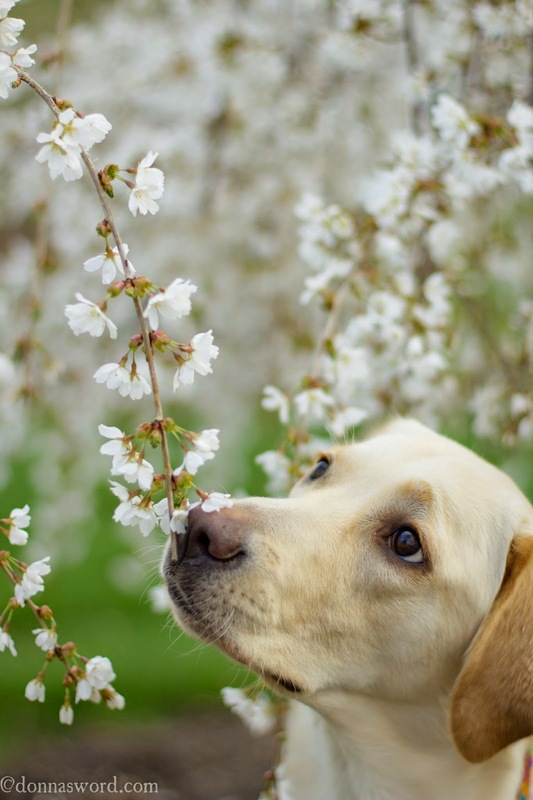 That attentive gaze is bee-lined onto a... well, that's a honey bee up there. So glad to see these critters are out and about doing their pollination work. What do you think? What is your preference ... Image #1 above or #2 below? 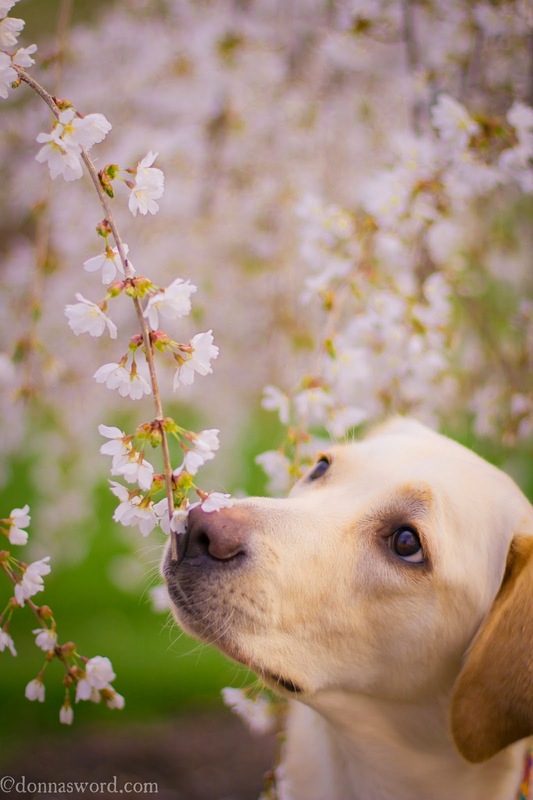 Take a pop over to our companion dog blog at Go. Do. Be Dog. 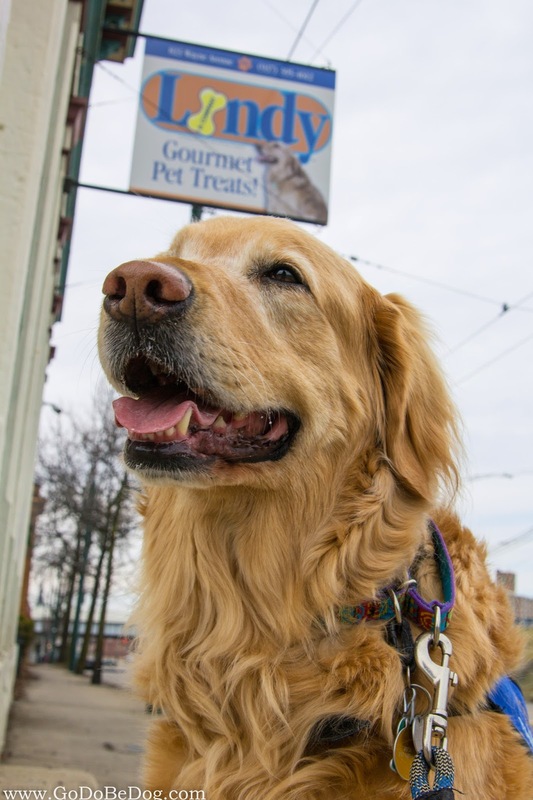 for a product review of Lindy and Company dog treats. Micron is asking me to update his resume. He wants to snag a job at this place. A career as a stunt double of the company's mascot, Lindy, is top of the list, what with the crazy good looks of these two goldens. And sure, a security guard role as Keeper of the Bacon Treats is a solid career choice as well. Maybe V.P of Canine Communications? The dog can bark your ear off if you let him. Micron is so busy with his volunteer work, though. I really don't think he has time for a full-time job and we're not even talking about his lack of work ethic. In the meantime, I'll distract him with a cookie or two. I think we'll go with a Peanut Butter but Better. Then it'll be his nap time. Harvest and Holly pause in their play session to get into the bunny spirit of the season. 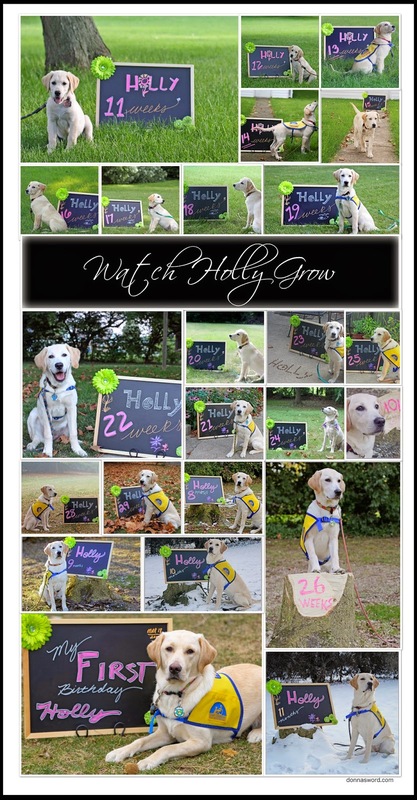 A closer inspection of the image above will confirm that, yes indeed, that is mud on Holly's legs. But it's springtime mud, of course. Can't avoid the stuff. 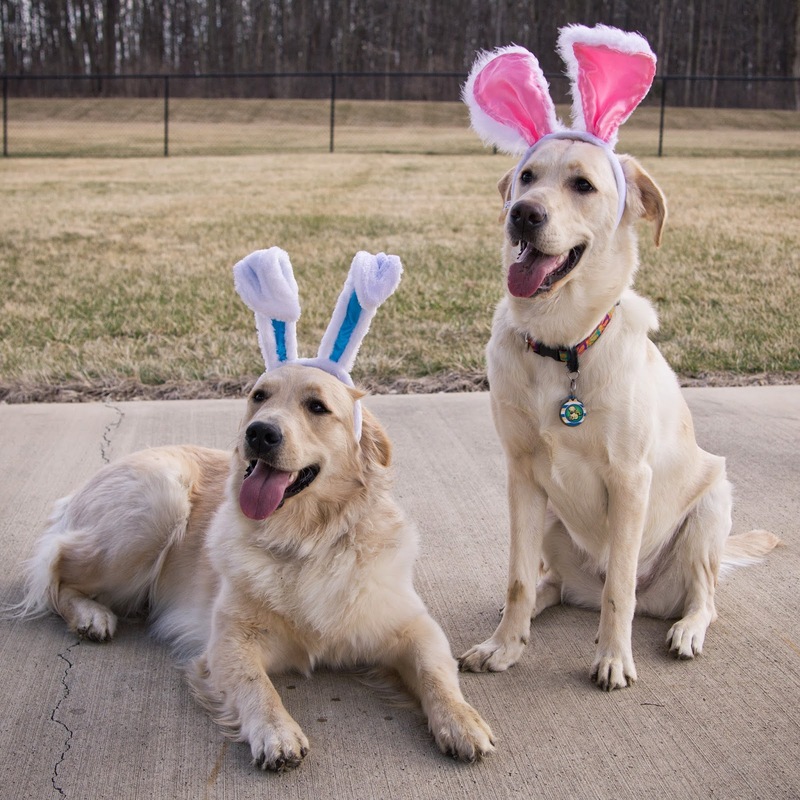 How difficult is it to take a photo of two active pups wearing bunny ears, you ask. Good question. We'd say it's not too bad, really. Even on this particular blustery March day. We recommend an individual of persistent personality to be in charge of the ears and a second biped to keep a firm finger on the shutter button.